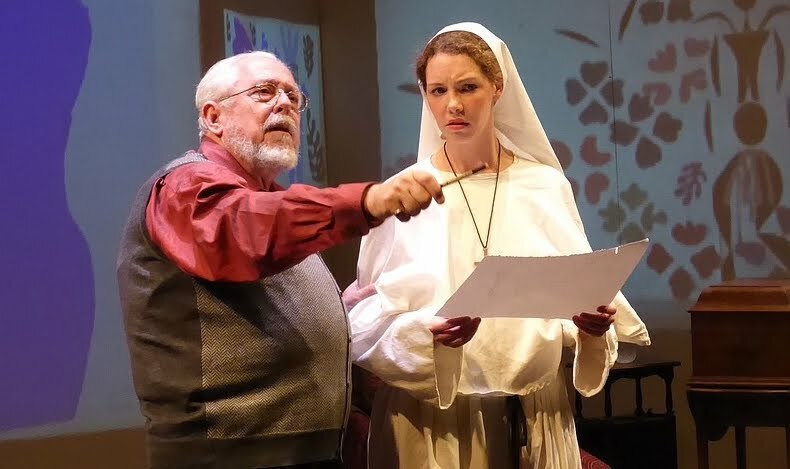 Carol's Theatre Reviews ~ It's Fun To Go Out: San Diego World Premiere “Color of Light” Casts Shades Of Brightness On Matisse’s Later Life. San Diego World Premiere “Color of Light” Casts Shades Of Brightness On Matisse’s Later Life. Matisse: I call upon that which is holy in me and ask that it be revealed in my work. Sister Jacques-Marie: But your work isn’t religious. Matisse: All art is religious if the artist is sincere. In Jessie Kornbluth’s world premiere play, “The Color of Light”, now showing at the 10th Avenue Arts Center, former home of Mo’Olelo, audiences are given an inside look into the ageing and frail artist, Matisse and how his recuperation from cancer surgery kept him alert and working with the help and inspiration of a novice nun and a grand plan for a church chapel. Kornbluth was not a playwright at the time he penned this play, but a writer none-the- less. He was inspired to write the piece after a visit to Provence, a trek to the chapel and an overwhelming feeling of its absolute beauty and a curiosity of how the chapel came to be. After much research into the later life of Matisse, he was moved to write “The Color of Light”. Kornbluth’s work is a co-production with Vantage Theatre and Talent to aMuse Theatre. It is playing at the downtown venue through Feb 3rd and is directed by Robert Salerno who also responsible for sound design and projections. This religiously devoted and caring young woman (barely old enough to drink in this country when they first meet) is a beautiful commentary on a little known fact in Matisse’s life, at least for yours truly. With O.P. Hadlock as the feisty and oft time sentimental Matisse, the story transitions in his drawing/studio/bedroom (O.P. Hadlock) with the ailing Matisse demanding the attention of his Russian caregiver/secretary Lydia (Bobbie Helland) to visits from his long time friend Pablo Picasso (James Steinberg) to strong opposition from the church in the form of an overly stern Mother Superior (Jody Catlin) to a rather over the top and daffy (and unnecessary) priest (Terrence J. Burke) claiming to have experience in architecture. 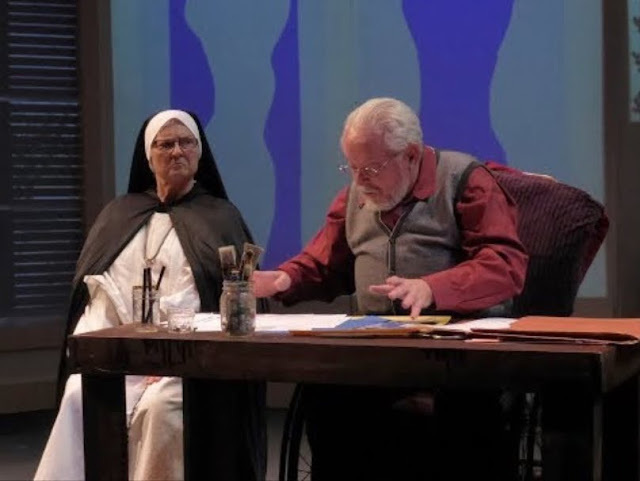 Aside from the distractions of the mother superior and the priest, the story unfolds in short somewhat choppy scenes that otherwise hold our interest, especially between Lydia, Monique and Matisse. The chemistry is there and all three actors immerse themselves into their characters with credibility and authority. The discussions about art vs. religion are intriguing but Michael Barahura’s lighting design and Salerno’s projections that bring out the brilliance of Matisse’s work that light up the stage, especially in Act II, are worth the trip downtown. Kornbluth’s work is a much needed shot in arm in the midst of the political insanity going on now by showing us that love and understanding, beauty and art still have a place in our lives whether we agree with each other or not. 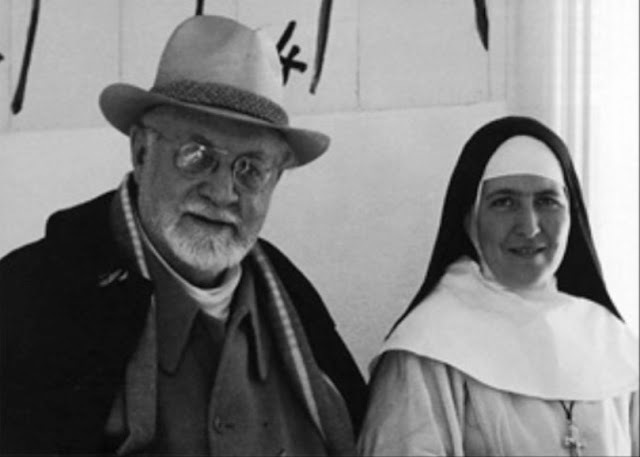 Matisse with Sister Jacques- Marie. Both artist and nun lived through harrowing times when dictators and detractors tried to overthrow countries destroying everything in their wake, but in their little corner of the universe, Matisse and Monique were able to shine another light on the world. 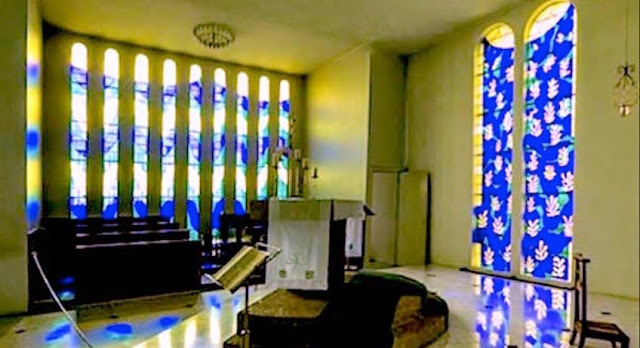 The completion of the Chapelle du Rosaire in Venice that Matisse would refer to as his “final and greatest work” is stunningly projected on the back walls and sides of the theatre at plays end with a picture of both artist and now Sister Jacques- Marie. It’s spine tingling. SCR’s “Shakespeare In Love” Measures Up To Movie.